Iran Releases 10 U.S. Navy Sailors, After Detaining Them Overnight : The Two-Way "There are no indications that the sailors were harmed during their brief detention," the Department of Defense says, confirming the release of nine men and one woman. The sailors had been aboard two riverine command boats — relatively small and fast attack craft — when they lost contact with the Navy, which has said the boats were transiting from Kuwait to Bahrain when they were detained. For hours after the detention, many details about the incident remained unknown. Today, Iran said a "broken navigation system" caused the boats to enter Iranian territorial waters illegally, and that it has received an apology. The Pentagon said a video released by Iran of an apparent apology by one of the sailors seems to be authentic. A Defense Department official who spoke on condition of anonymity said, "Clearly this staged video exhibits a Sailor making an apology in an unknown context as an effort to defuse a tense situation and protect his crew." After the sailors' release, Secretary of Defense Ash Carter said, "I am pleased that 10 U.S. Navy sailors have departed Iran and are now back in U.S. hands." Carter also thanked Secretary of State John Kerry "for his diplomatic engagement with Iran to secure our sailors' swift return." As Eyder reported for the Two-Way last night, Pentagon press secretary Peter Cook said the U.S. was in touch with the Iranians, who "informed us of the safety and well-being of our personnel." Photos posted online by the Iranian News Agency show the U.S. service members sitting shoeless on carpets in a room, leaning against cushions on a wall. 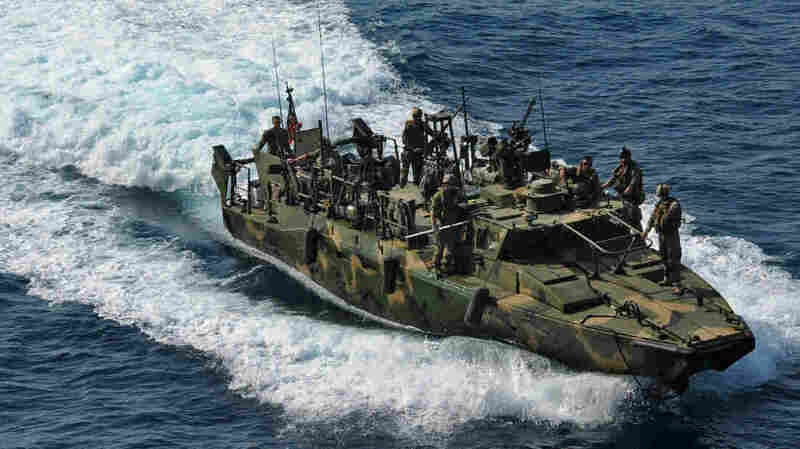 Iran's FARS news agency says their armed boats had been three nautical miles into Iranian territory when they were detained. Announcing the release of the Americans today, the Iranian Revolutionary Guards Corps said, "It became clear that the U.S. combat vessels' illegal entry into the Islamic Republic of Iran's waters was the result of an unpurposeful action and a mistake." After their release, the sailors were airlifted ashore and replaced on the boats by other crews, according to the Pentagon. "The Navy will investigate the circumstances that led to the Sailors' presence in Iran," the Department of Defense says.